Originally established as King’s College in 1754, Columbia University is the oldest university in New York State. If you’re visiting Upper Manhattan, touring this esteemed institution of higher education is a must. The school’s history and architecture are in a league entirely of their own, and you’ll see the place that has produced countless politicians, artists, and Nobel Prize winners. The Morningside Heights neighborhood is (mostly) a college town within the city. It is also known as New York’s Acropolis due to its elevated perch on a bluff of Manhattan schist and its concentration of educational, religious, and medical institutions. And all that foot traffic means that in addition to bookstores and bars, there are restaurants to cater to every taste. Unlike Columbia University, though, not all eating establishments in the neighborhood withstand the test of time. A restaurant that opens up one semester may be gone the next, which is perhaps why reliable chains (that can afford the commercial rent) like Shake Shack, Pret A Manger, and Sweetgreen have sprung up recently. So if you’re exploring Morningside Heights and looking for a great local bite, here are a few suggestions. These restaurants vary in their life spans, but they’ve been around long enough to prove they have staying power. It’s been suggested that their bagels may be the best in the city, or at the very least, the best in Upper Manhattan. That’s a bold statement in New York City, probably enough so that you should come and try them out yourself and see where they rank. It’s a popular place; if you come on a weekend, you’ll stand in line for a while but you’ll be paid off in fresh, warm bagels. There’s not a lot of seating inside, so it’s more of a grab-and-go place. All types of bagels and spreads are available, as are breakfast and lunch sandwiches. If the weather allows, head west for a short walk to Riverside Park or east for an equally short walk to Central Park. Breakfast, lunch, and dinner are served at this restaurant that advertises their food as “eclectic-American.” Serving seasonal, local, and organic food is their goal. The menu has a good selection of healthy dishes like warm lentil salad and veggie-loaded rice bowls. The restaurant is spacious so they can usually accommodate a group; if it’s available, they have a large table in the back that can be reserved for big groups (they otherwise do not take reservations). If you’re there during breakfast hours, pancakes are one of the dishes they do best. A little further uptown but worth the walk if you’re craving barbecue. The Dinosaur founders started their business on the road, bringing barbecued meat to motorcycle shows and festivals, or any place where bikers gathered. Eventually, they rooted themselves in Syracuse, NY and subsequently opened locations around the Tri-State area. The Harlem location opened in 2004 and is consistently ranked as one of the best barbecue joints in the city. Come hungry. The slow-cooked ribs and other meats are served with corn bread and your choice of two side dishes. It’s a nice big space that can accommodate groups, and they have live jazz music on Friday and Saturday nights. Students and professors; writers and artists. This is the crowd that this neighborhood staple has attracted for the last 50 years. The Hungarian Pastry Shop feels like an old world, European café and serves specialty coffees and Eastern European desserts like apple strudel and cherry tarts. It’s the quintessential college coffee shop. The dim lights and cozy, cluttered vibe will keep you there for hours. It’s one of those great, New York institutions that you don’t want to miss if you’re in the neighborhood. Feel free to leave your favorite protest statement on a bathroom wall, if you can find a good/available spot in the tiny bathroom. Brothers Vincent and Tony Curcurato started V & T as a pizzeria in 1945, after they both returned home from the war. They moved to their current location in 1951 and have been a neighborhood favorite among locals and college students ever since. Their menu has expanded from pizza to hearty Italian comfort food like chicken parmesan, fettucine Alfredo, and veal Marsala. The portions are large and the restaurant can accommodate large groups. If you’re on the hunt for a good burger but want a more neighborhood feeling than Shake Shack, this is your place. Mel’s is pretty successful at providing a space where you can stop in once in your life, or once every week and still feel like a regular. Come in for some hearty American fare like burgers, loaded nachos, or fried pickles, but if it’s peace and quiet you’re looking for, you might want to look elsewhere. The walls are lined with television screens and neon signs and lend to a pretty lively atmosphere. The selection of craft beers will have you settling back in to your red patent leather booth. Lunch and dinner, plus a weekend brunch with bottomless cocktails are served. Appealing photos of Bangkok food markets decorate the walls. The menu is inspired by Thai street food and while you’re obviously far from Bangkok, the food does its best to make you feel like you’re there. That means standard and delicious Thai staples like pad thai, green curry, and a great selection of spicy salads are available. For dessert try green tea or ginger ice cream, or that curious, ubiquitous sweet treat, mango and sticky rice. There’s not a lot of Thai food to choose from in Upper Manhattan, so it’s a lucky break for us that Thai Market comes through with truly good food. 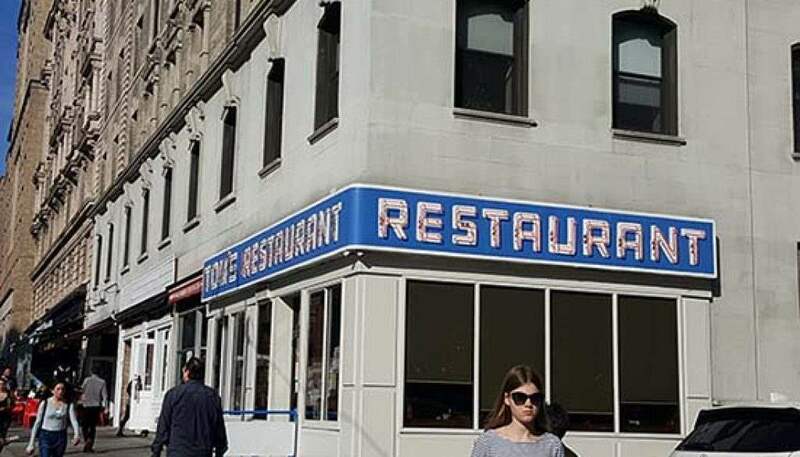 That iconic image of the corner restaurant will hit you and you’ll recognize Tom’s as the place where Jerry and friends gathered on Seinfeld, delivering one-liners that are now forever woven into our popular culture. Don’t expect the inside to look the same; it was merely an inspiration for Monk’s Diner, and one of the most popular sitcoms of all time was actually entirely filmed in Los Angeles. Though Seinfeld brought fame to Tom’s in the 1990s, they’ve been a Morningside Heights fixture for more than 70 years. It’s your typical New York City diner menu, meaning large portions of everything from omelets to ice cream sundaes. Grab a stool at the counter or a booth with friends and family. 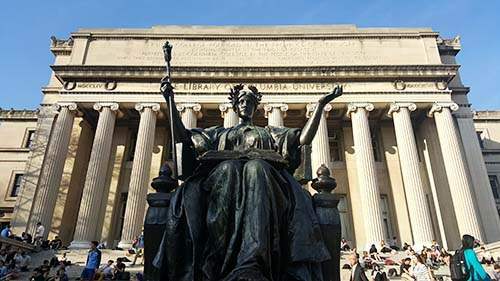 On a related note, if you plan on exploring Morningside Heights or nearby Hamilton Heights, please get in touch with us about booking our private Uptown Explorer walking tour, which explores some of the most famous landmarks in these two historic NYC neighborhoods.